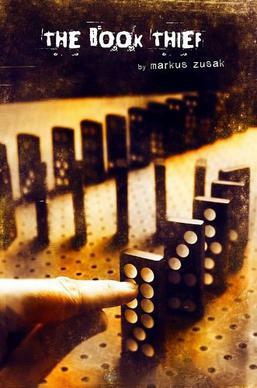 Zusak, Markus. The BooK Thief. Random House: New York, NY. 2005. ISBN: 9780375842207. The Book Thief is about a girl named Liesel Meminger, who is growing up in Nazi Germany. Her thievery of books begins when she picks up a book called The Grave Digger’s Handbook, which was left by her brother’s grave by accident. She was intrigued by the book, and compelled to keep it, despite not knowing how to read. She is sent to live with foster parents. Her foster father helps her learn how to read, and Liesel is taken over by books. She loves them and will get them any way she can, even if it means stealing them from the Nazi’s. When her foster family hide’s a Jewish man, Liesel’s life drastically changes, more so than already had. I really enjoyed this. I absolutely love books that take place during the Holocaust. The time period is a very interesting, albeit, depressing time period to learn about. The Characters: I thought the characters were very well written, especially Liesle, her family, and Rudy. These characters were brought to life in the pages and so anything that happened to them, I felt. Sometimes I didn’t like the characters, and sometimes I did, and that’s how you know the writing is good. They were very well rounded. Setting: I felt like I was in Nazi Germany, which is terrifying and interesting. All the little details about the Nazi’s brought this story to life. You could feel the fear you would’ve felt had you actually been there. I found myself holding my breath at times, trying not to make a sound and give everyone away. Of course, I’m not in Nazi Germany in 1939, I’m in America in 2016. Plot: I love the story. The concept of a girl unable to reading becoming intrigued by the written world is fascinating to me. I also love how it reminds me of Fahrenheit 451, as Liesle is stealing books from the burning rubble, hoping to save them. The plot is very unique and I really enjoyed it. Style: Here’s what turned me off. I was not a fan of it being written from Death’s point of view. Of course, I understand why it was written from his point of view, Death was exceptionally busy back then. But I felt I would have connected more with the characters had it been written from 1st person or 3rd person omniscient. I felt that having death narrate it pulled me out of the book too much. There was too much jumping around, information that was not needed, etc. All together, a good book. I did enjoy it, but it will join the ranks with the The Diary of a Young Girl, a book that was okay but won’t be rereading.